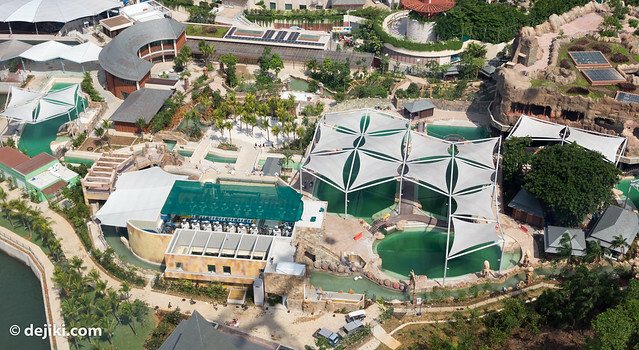 It is time for another update on Marine Life Park – the most exciting one so far! 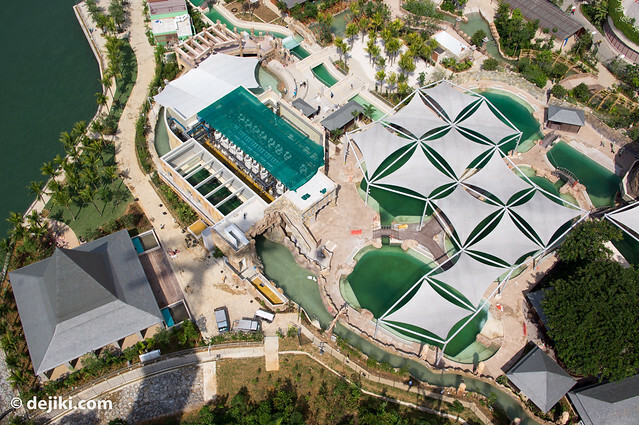 Please refer to the first entry for more information about the park. Most of the major construction has been completed. 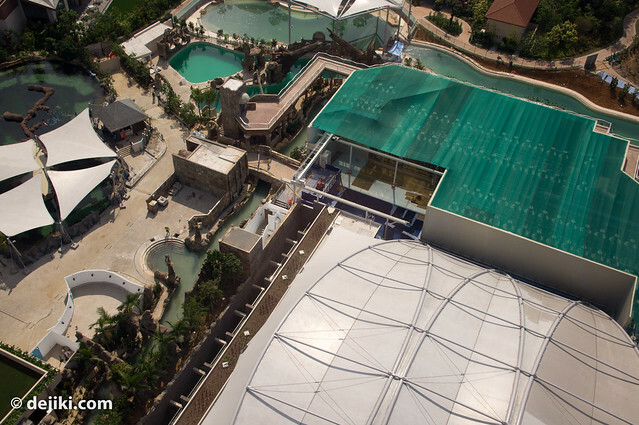 Almost all the tanks (and Adventure River) in the park are now filled with water. Park crew can be sighted at some places within the park. 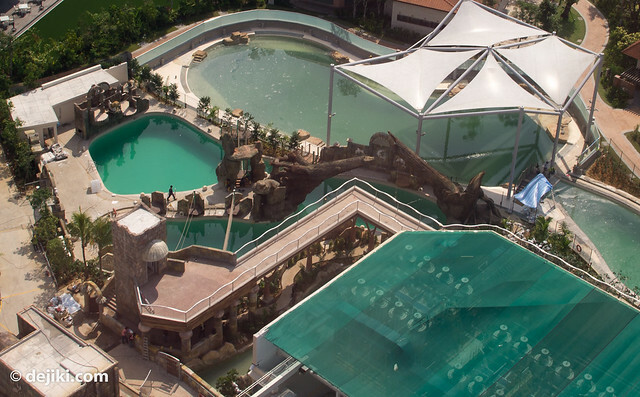 It is also common to see MLP Park crew walking around Resorts World Sentosa – watch for sky-blue and navy polo shirts with a few angelfish on the right side. Things are looking great at the “Waterfront Side”, with most of the heavy equipment gone and we can now see the final (or near-final) pale sandy flooring for this zone. 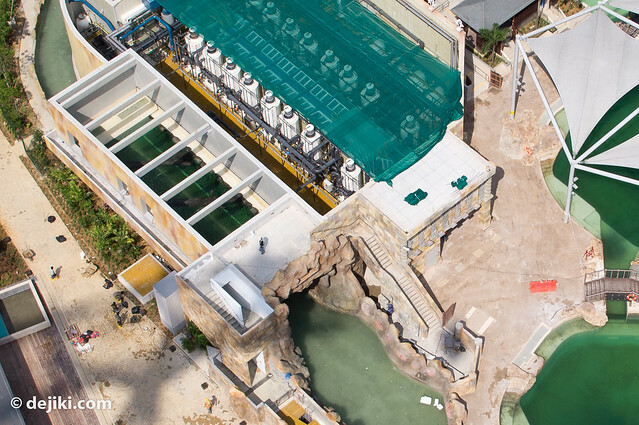 Looks like Adventure River riders will be able to enjoy an overhead tank as they go into this cave. Note the long, brown-coloured covered area. What is it exactly? I took a walk to that area – turns out it’s a very big locker area. 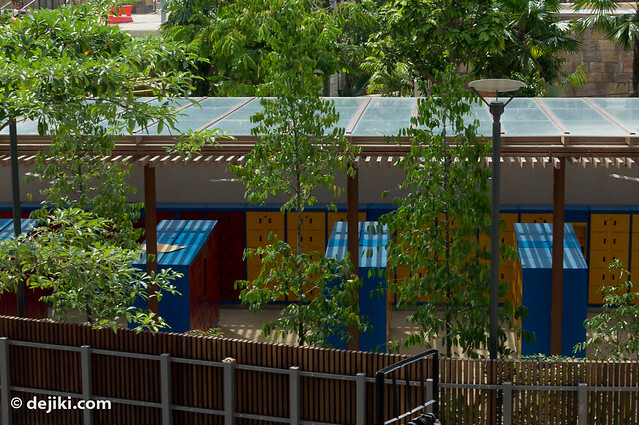 The lockers look like the same touchscreen sort used in Universal Studios Singapore. 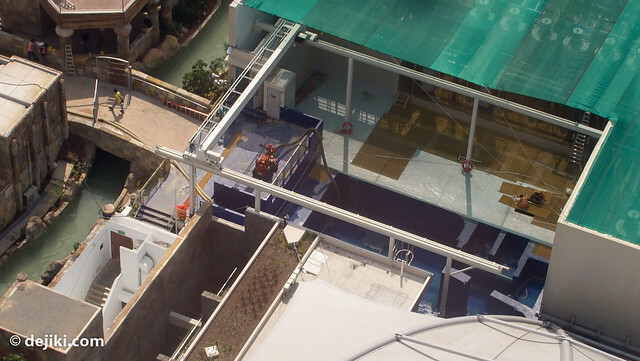 Roof works for the large aquarium is nearly complete. This segment of the Adventure River looks nicely decorated. In contrast, the walkway on the second level is way too barren. 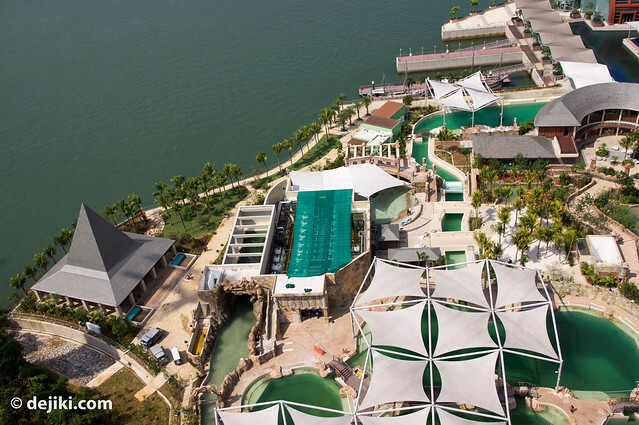 Over at the “Shark tooth-shaped” pool, it looks like some sort of activity zone. There are rope bridges being installed here, as well as pool ladders. There’s some activity over at the Reef Swim. There appears to another tank here, at the second level of the white building. 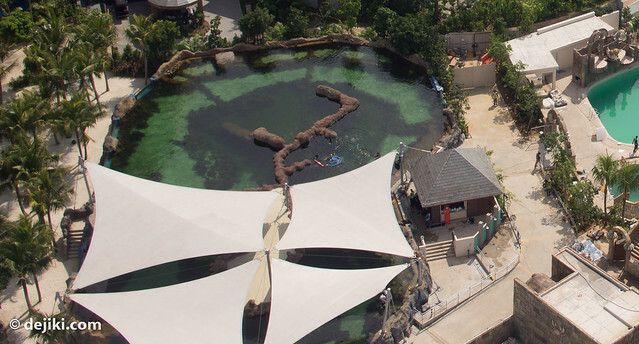 Given how it looks, this could be a backstage care area for the marine creatures. 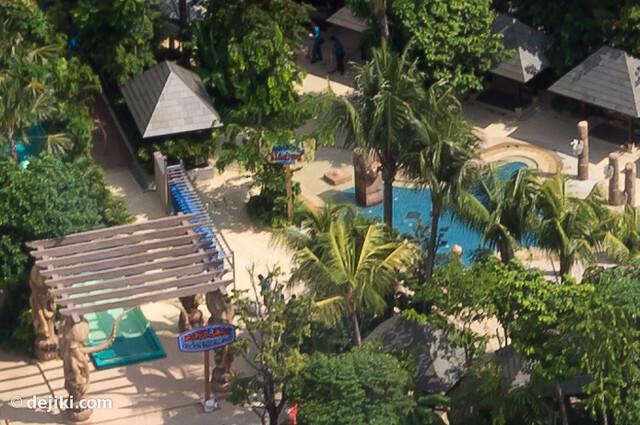 As you can see, there are gates at the top-left of this photo, meaning this area may be closed off to park guests. 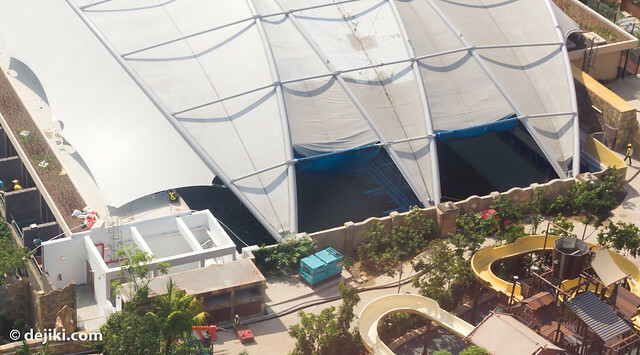 This is the only “exposed” area of the large aquarium. It is now filled with water. The blue object is a bridge over the water. Let’s take a look at the other end of the park. 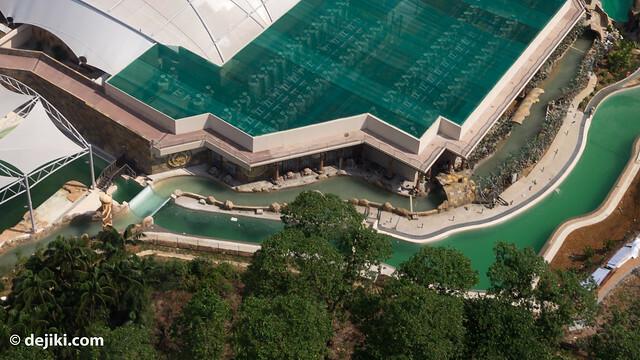 The Wave pool has been thoroughly cleaned! Nothing but sparkling blue waters there now. 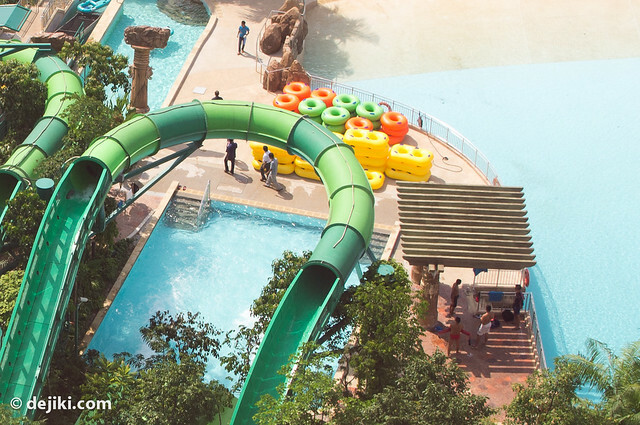 You might also notice that some of the slides are actually in operation. More park staff here – Training or Leisure? Some ride signs have been put up. They are just ride names, with no wait time information. I’ll need to bring my zoom lens along next time to see them clearly. That’s all for this update. Stay tuned (Subscribe!) for the next update in a few weeks. It’s exciting to see all these developments. 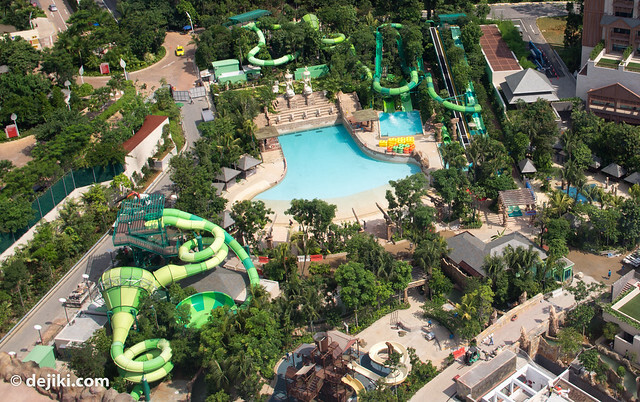 The adventure river is my favorite because it seems to contain a great number of surprieses! 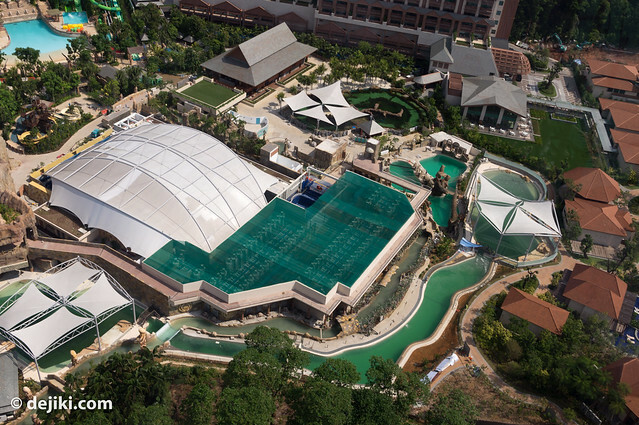 Another fantastic update, I’m seriously looking forward to spending some of my honeymoon in Singapore in the Waterpark. 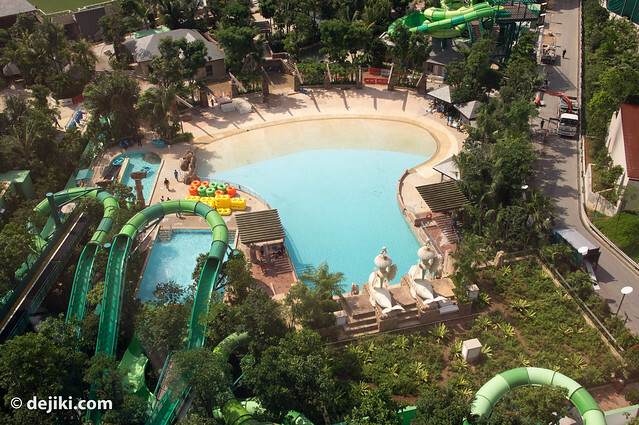 That adventure river looks far to interesting! Thanks for the update. 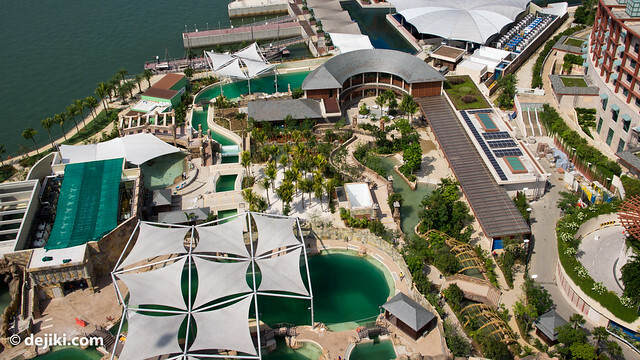 The dolphins are supposedly arriving this month (June), and it looks like the pools will be ready to receive them. September opening looks possible now. That’s certainly good news. Thanks for the heads up, Zooish!